Left: Charred fir planks are used over the windows as scrims. Steps lead from the main house to the backyard and the guest house beyond. 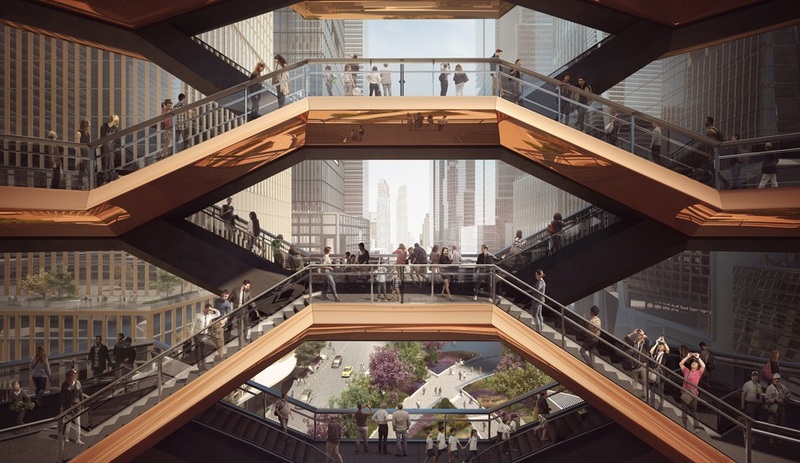 Left: Double-thick concrete walls emphatically display the rough look of board-form wood grain; Right: A ladder to the rooftop is surrounded by steel perforated with random holes. The house has numerous such “micro-moments,” which lend it an unexpected playfulness. 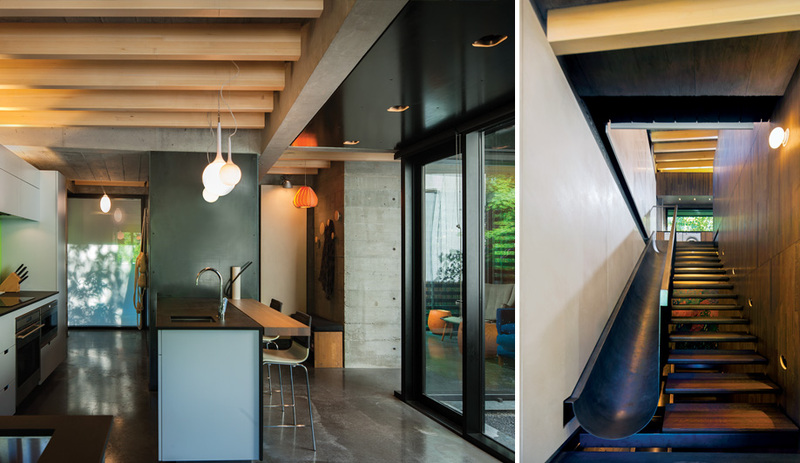 Left: Exposed concrete on the floors and walls gives a rugged, textured look; Right: A steel slide next to the stairs is for the grandchildren. Later, it can be converted into a stair lift. The house is something of a new paradigm for Measured Architecture, the local firm Cuddington founded in 2007. Its first major residential project was a behemoth known as Wolfe House, which became a kind of calling card for the firm, and a chance for him to try out his favourite materials (earth-toned granite) and gestures (artfully juxtaposed asymmetric volumes and planes). More recently, Measured has raised its profile with a deft renovation of Equinox Gallery, via a scheme that strategically configured expansive sheets of white drywall to amplify the gallery’s sense of extroversion. 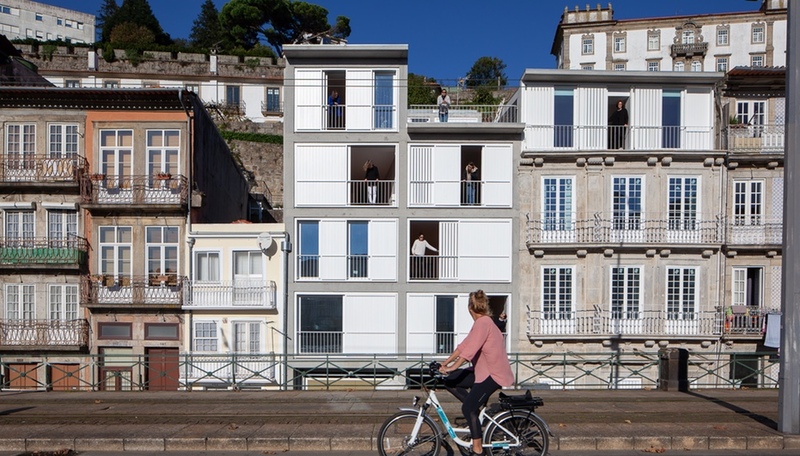 Cloister House is the conceptual opposite: a tautly proportioned, highly private house – an architectural introversion. Along with Piers Cunnington and Katy Young, Cuddington has imbued the project with what might seem like contrary characteristics: deliberate darkness, industrial materiality and playfulness. The defining material is charred board form concrete, which emphatically displays the rough wood grain. 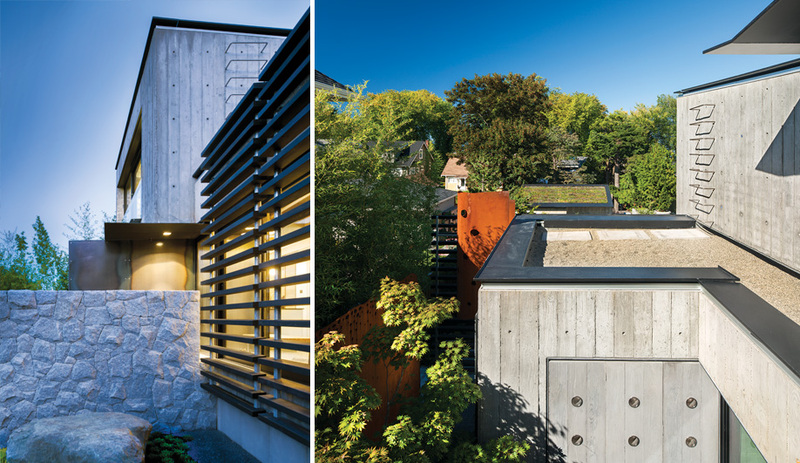 The secondary materials, torched wood and galvanized steel, mark the house as audaciously contemporary. 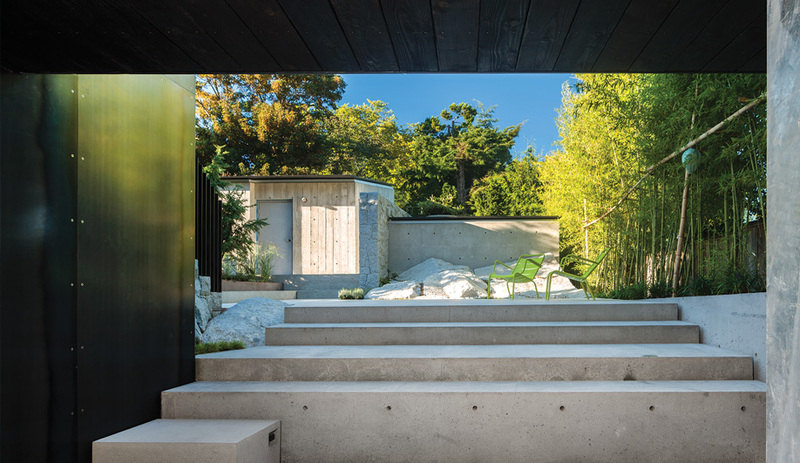 The fir planks used for the formwork were re-charred, which rendered them dark and durable, and then installed over the front-room window wall and throughout the house as scrims. 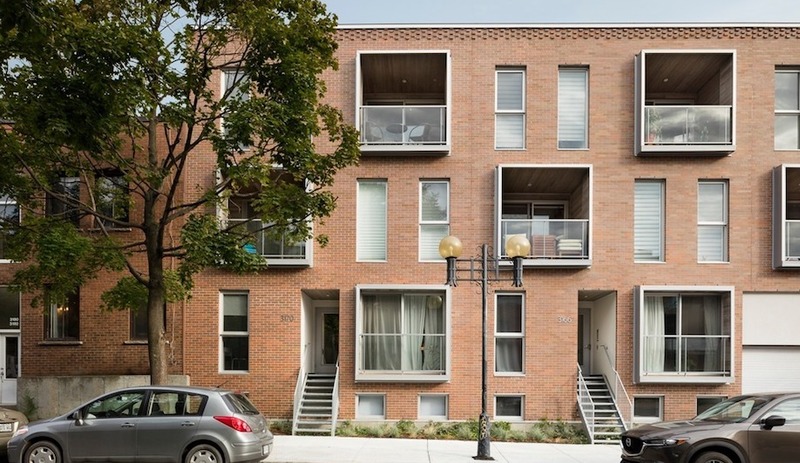 In a neighbourhood that is slowly being devoured by monster homes, Cloister can be seen as a sustainable offering, relatively speaking. The existing dilapidated bungalow was carefully pulled apart by hand, as part of a city-supported pilot project to supply job training for underemployed youth. The new build nods to eco-friendliness by virtue of its size: at 223 square metres, plus a 56‑square-metre guest house, it’s still well below the lot limits. 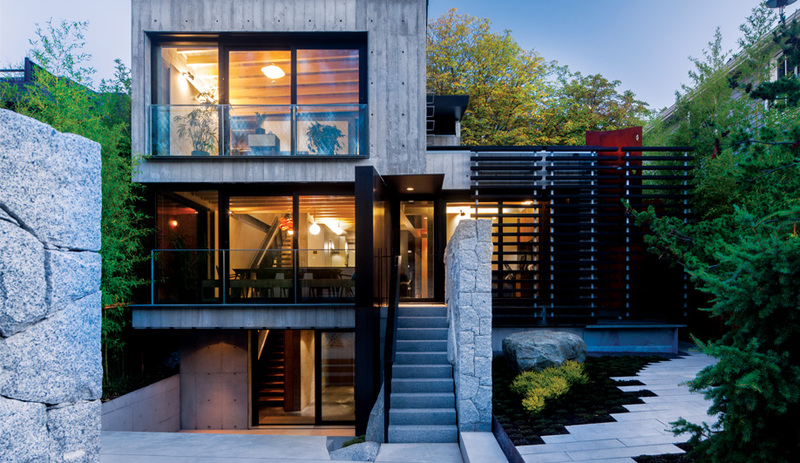 It also employs the Passive House Standard for heating and cooling. Sustainability, though, is a multi-step dance; the eco-savings in those realms are partially offset by eco-spending in others. Steel and reinforced concrete are strong-arm materials imbued with energy conservation. 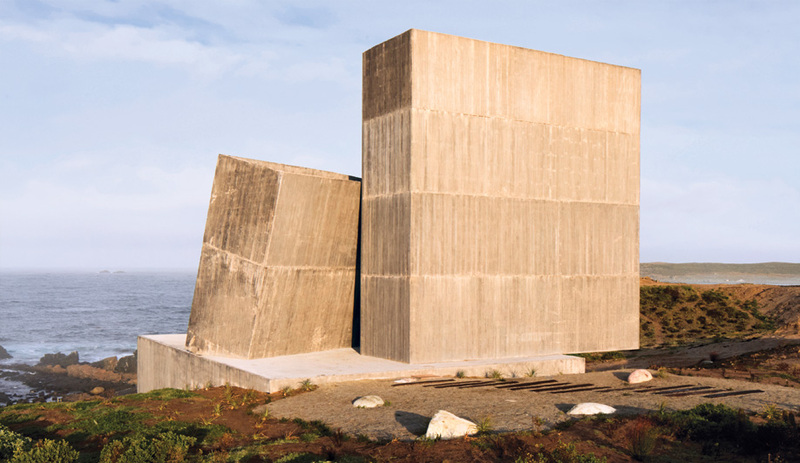 Here, they are doubled up, with some of the home’s already-thick concrete walls sheathed in steel. The material choice also enables a hyper-clean environment, essential for the client’s asthma (for this reason, there is not an inch of drywall in the entire house). Above all, this is an architecture that celebrates the underrated glories of the dark, dense enclave. 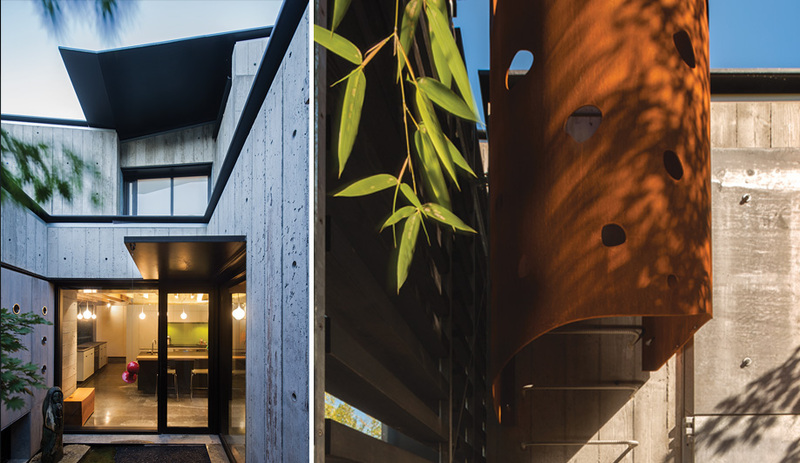 The house exudes life in what he refers to as “micro-moments,” a flush-to-the-ground window in a study alcove; an amorphous fence of oxidized steel by artist Fei Disbrow; and the front facade’s dynamically canted sub-wall. One of the most playful gestures is found in the waxed mild-steel slides affixed to both staircases – for the grandkids now, and convertible to a stair lift in the future.